Yarn, Medium Weight. I used the “I Love This Cotton” brand in Pink Spark. It is 97% cotton and 3% glitter yarn. Clear, standard sized ornament. I used a plastic ornament. 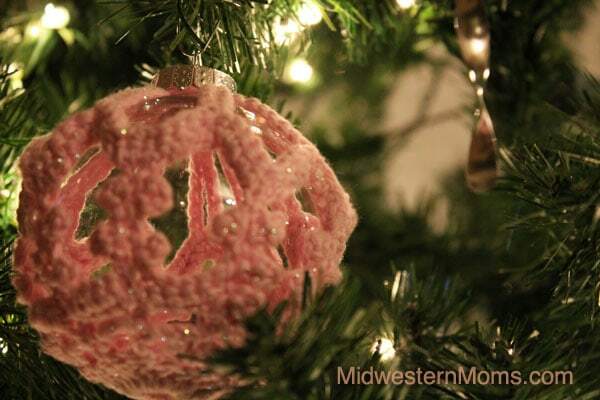 Step 1: Download the free pattern for this crochet ornament cover on Ravelry. You can start an account with Ravelry for free and find a ton of different crochet and knit patterns for free also! 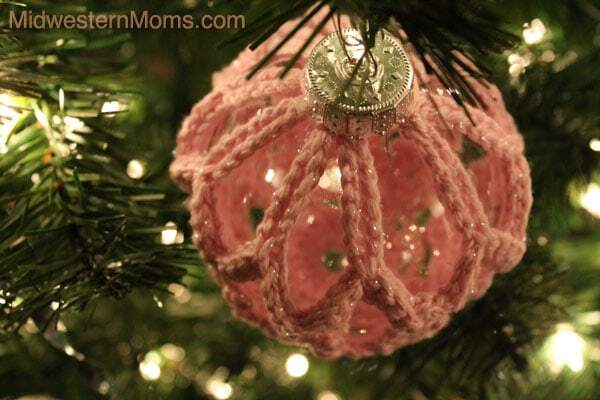 Step 2: Using your yarn and crochet hook, crochet the pattern and attach it to the ornament by the loops at the top. I did find myself modifying the pattern a bit (as I do with many patterns) in order to fit my gauge and also to fit the size of ornament better. I was so pleased with the result and I hope that you have as much fun with your ornament as I did! Here is another photo of my finished ornament. Thanks! I loved your duct tape ornament today! Thanks Amber! Your yarn ornament was pretty also! This is so beautiful. I don’t crochet but may have to learn just to make these! Thank you! It was a pretty simple project, with some picot stitches, which were new to me. Crochet is a lot of fun and you can make some really beautiful things! That is so pretty! I want to know how to crochet.. I am loving the pink! Thanks April! If you are wanting to learn, check out Crochet Geek on You Tube. She has amazing instructional videos that are very easy to understand. She is my go-to resource for new stitches. 🙂 Good luck!